A lot of work goes into refinishing a bathtub, more than you might think. In fact, about 98 percent of a bathtub refinishing job is the preparation that takes place before the bathtub is painted. The other 2 percent is using a quality bathtub refinishing coating and the technique of a professional bathtub refinisher. If you think your bathtub is in need of refinishing, then there are a few questions that you need to ask yourself. 1. What is bathtub refinishing? Bathtub refinishing also known as bathtub reglazing or bathtub resurfacing is the process in which a coating is applied to a bathtub surface to renew the look. 2. Can your bathtub be refinished? In most circumstances your bathtub can be refinished. 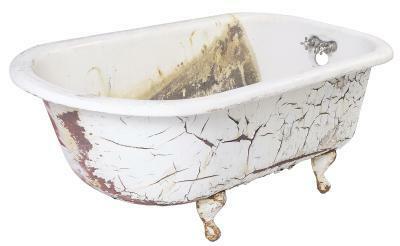 The most common types of bathtubs are cast iron, steel, fiberglass and acrylic. It would be good practice to know what type of bathtub you have and whether it has been previously refinished or not before considering bathtub refinishing as in some cases a different refinishing approach may be necessary. 3. Should I attempt bathtub refinishing myself? As stated above, a lot goes into refinishing a bathtub and it’s much more than simply cleaning off the surface and brushing on a finish. An improperly refinished bathtub will end up costing you more in the end than if you had just hired a profes sional bathtub refinisher to complete the job to begin with. While there are a few DIY bathtub refinishing kits on the market, none of them will deliver the performance you should expect and one of the biggest complaints is a peeling bathtub bottom. Two factors play in this scenario; improper preparation and inferior product. For a bathtub finish that is going to look good and last, it should be done using a quality bathtub refinishing product and applied by a professional. 4. What is the bathtub refinishing process? In short, the process involves preparing the bathtub surface, masking off the surrounding areas and painting just like you would do on a car. However, not all refinishers and the process they use are the same. In the old days, a refinisher would etch a bathtub surface using a very strong hydrofluoric acid in order to remove the gloss and pit the surface so an epoxy primer would have something to embed itself into. This was done in order to create a sufficient bond to the bathtub prior to applying the new glossy finish and there are still a number of refinishers out there that continue to utilize this method. When done properly, this method works quite well but, like stated above, not all refinishers are the same. When I say this, I mean not all refinishers will take the time to do it right and truthfully. The old way of bathtub refinishing has given way to the new age of refinishing. This new age of bathtub refinishing simply involves cleaning the surface with a heavy duty cleaner, applying an adhesive material which will create a molecular bond between the bathtub surface and the new glossy finish to be applied. This way of refinishing is a lot faster and in my opinion has a much better track record for non-failed bathtub finishes. 5. How long will a refinished bathtub last? This all depends on several factors. Was the refinisher a qualified bathtub refinishing professional? The quality of the bathtub refinishing product. Was the surface prepared correctly? How was the surface maintained? Let’s say that if all of these factors have been taken in, your refinished bathtub could last 8-10 years. However, if any of these factors have been compromised, your refinished bathtub will not survive the test of time. You should use care when soliciting services from a bathtub refinishing professional. Make sure they have had proper bathtub refinishing training and are qualified to do the work. Make sure they use a bathtub refinishing product that has a track record. Check references that are at least a few years old to see if those customers are still happy and make sure the refinisher educates you on the proper maintenance and gives you a written warranty. If you do these things, you will be sure to have a happy bathtub refinishing experience. If you need assistance in finding a qualified bathtub refinishing professional, visit Topkote’s Find-A-Pro website to locate a professional bathtub refinisher near you or call 1-888-TOPKOTE. We will be glad to help. I really appreciate this information on frequently asked questions about bathtub refinishing. My husband and I are trying to get our home ready to sell, and a friend mentioned that a type of re-glazing for our bathtub might help spruce it up, and it sounds like a great idea. I like that this explains how the process goes, and why it is important to leave it to the professionals. Thanks for the information! I had no idea that my acrylic bathtub could be refinished. My husband thought we'd have to just get a new one for our bathroom remodel. Thanks for pointing that out and I'll be sure to show my husband, so we can be sure the contractor we choose knows how to do that successfully.